Infinity Waterslide Decals 105 x 148mm sheet. This sheet includes logos for the faction and Sectorial Armies and different alphanumerical symbols to further customize your army with an extra level of details. Infinity Waterslide Decals 105 x 148mm sheet. Includes generic and Sectorial Army logos for the Infinity faction. Also includes different black and white alphanumerical symbols. 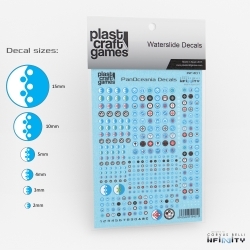 This sheet includes 349 decals with different diameters: 15mm, 10mm, 5mm, 4mm, 3mm and 2mm.